Pavlensky came to France via Ukraine in January 2017, after fleeing Russia, where he faced sexual assault charges. But he became as critical of France as he was of Vladimir Putin’s rule in Russia, which he depicted as a police state. In targeting the Bank of France, he denounced “the bankers (who) took the place of the monarchs”. In a Facebook post on 7 September, Shalygina shared Pavlensky’s account of abuse that he said he and other inmates were subject to at Fleury-Mérogis prison in a suburb of Paris. He described it as much worse than in Moscow’s Butyrka prison, where he had been held. The French prison guards, he wrote, “throw [prisoners] on the floor, strangle until there is rattling [in the throat], twist arms, pull handcuffs back so that the skin on wrists splits”. Pavlensky said that he had been sent to solitary confinement and that “it’s clear that the administration is taunting me”. During a pre-trail court hearing held today, a Bank of France representative said the institution might sue Pavlensky for “defamation”, to which the artist responded that the institution is “a symbol of the destruction of all revolutionary initiatives, which financed the destruction of 35,000 people”. Shalygina told Russian service of Radio France Internationale (RFI) that she was surprised by the ruling because the “prosecutor had given a long speech and set out around five points according to which [Pavlensky] definitely must not be released”. The prosecutor also argued that Pavlensky should be kept in prison “for ten years because he is ‘extremely dangerous’, might escape and in general do it all over again,” Shalygina said. According to RFI, the Paris court ruled that Pavlensky be released but ordered him to report regularly to police. His trial will begin in January 2019, the Meduza news site reported. Meanwhile, Femen activists showed their support for Pavlensky by recreating his first Moscow protest outside the courthouse. 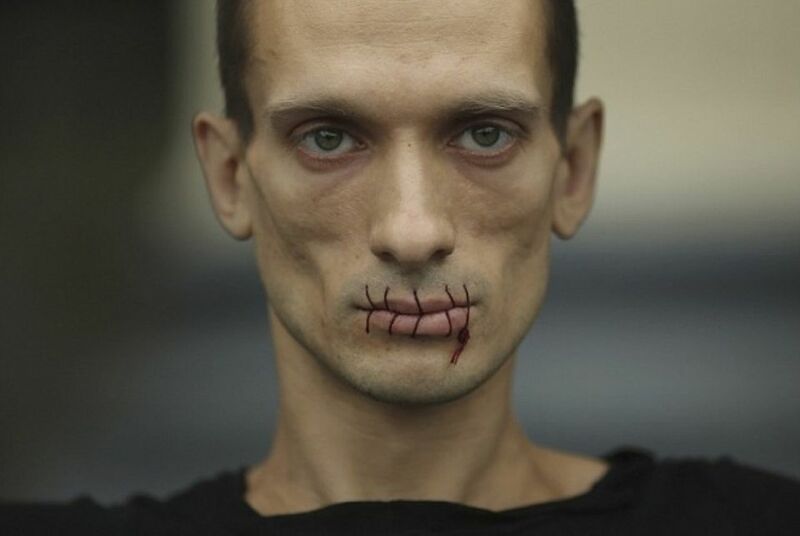 With their mouths sewn shut, the activists “denounced the disproportionate repression led by the French state towards Piotr Pavlenski and the willingness to muzzle his militant speech and to deny his freedom of expression,” Tweeted the human rights activist and Femen member Inna Shevchenko.